The 2nd Annual Licensing Survey is Open! Today, we’re launching our 2nd annual licensing survey! We want to know what games you want to see brought over. Let your voice be heard and enter for a chance to win one of five copies of our upcoming title, Kindred Spirits on the Roof! 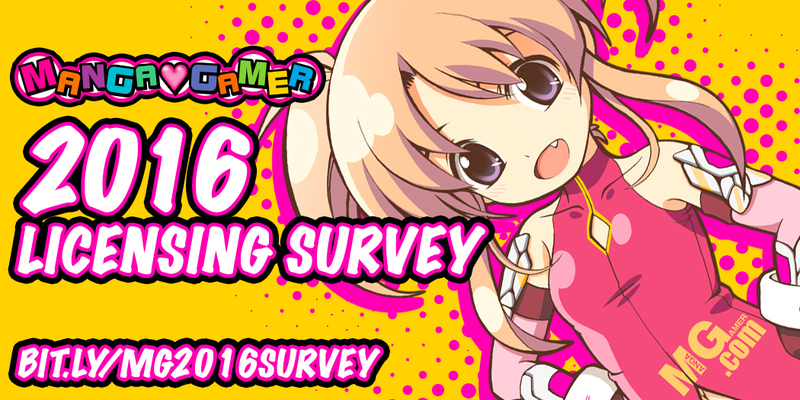 The survey will be open through February 12th. Do you think once this is over you could release more of the info from last year like top 30 or 40 games list? I’m still curious what the two that were licensed by other companies are. I hope that MangaGamer will focus more on games with gameplay, with a simultaneous release of All-ages version(Steam) and 18+ on MangaGamer/partner site. I wonder if somebody is going to license Tokyo Necro. Pretty much anything gameplay wise i will buy all of it from you. I LOVE SRPG and RPG and Strategy stuff with VN’s so anything having that or gameplay in general (i’m pretty okay with card games too) I’ll buy. AliceSoft still has a good amount of games untranslated, get some of those~. Well, i guess i would be interested in any kind of VN that has a strategy kind of element, Rpg and such, purely just reading is kind of boring especially if the story is not that great. Though Aiyoku no Eustia would be awesome if translated. Well either way keep up the good work and god speed. Damn, I’m late >_<. I sent this to MangaGamer, but I think I will leave this here as well to voice my interest..
Hi. I was wondering if MangaGamer would be interested in picking up Kenseiki Alpha Ride (https://vndb.org/v14325)? That R-18+ game is the third part of the Kikouyoku Senki Series trilogy that consists of Kikouyoku Senki Tenkuu no Yumina, game translated by JAST Densetsu, and Kikouyoku Senki Gin no Toki no Corona, game that still remains untranslated. While JAST already have a hand in the Kikouyoku Senki Series with their Yumina release, I think it would be great if MangaGamer got in on it as well. Aselia (released by JAST) and the upcoming Seinarukana (also going to be released by JAST) belongs to the Eternity Sword Series, and both are exceptional turn based strategy games. However, neither Yumina and Corona neither are true turn based strategy games, but Kenseiki Alpha Ride is. So I think picking up Kenseiki Alpha Ride will be a good opportunity for MangaGamer to expand towards visual novels with SRPG gameplay and a good place to start is Kenseiki Alpha Ride. And later if all is well, maybe a Kikouyoku Senki Gin no Toki no Corona release is possible down the line, that way the Kikouyoku Senki Series will be done and MangaGamer will leave a nice mark of being the ones to help wrap up the trilogy.